Instant Replay Review upheld 2B Umpire Lance Barksdale's out call in the top of the 6th inning of the Blue Jays-Red Sox game. 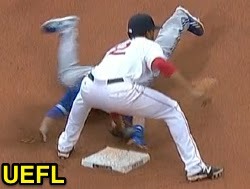 With one out and one on, Blue Jays baserunner R1 Kevin Pillar attempted to steal second base off Red Sox catcher A.J. Pierzynski, who threw to shortstop Xander Bogaerts as Pillar slid into the bag. Upon Replay Review as the result of a challenge by Blue Jays Manager John Gibbons, Barksdale's ruling was affirmed, the call was correct. At the time of the review, the Blue Jays were leading, 7-2. The Blue Jays ultimately won the contest, 7-2. This is Lance Barksdale (23)'s fifth Replay Review of the 2014 MLB Regular Season. This is Crew Chief Gary Cederstrom's 20th supervised Replay Review of the 2014 season. This is the 341st Instant Replay Review of the 2014 MLB Regular Season. This is Blue Jays Manager John Gibbons' 18th Replay Review of 2014. Umpires are now 179/341 (.525 Affirmation Rate) in Replay Reviews during the 2014 MLB season.